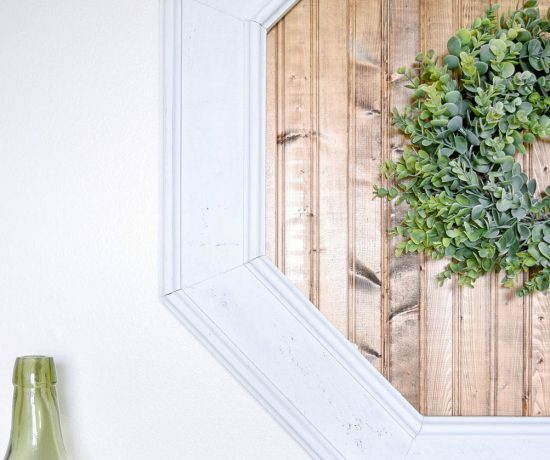 While it’s still pretty chilly here in Minnesota we are definitely getting ready for the spring weather on the INSIDE of our homes. We joined together with a great bunch of bloggers to bring you some awesome spring-spirations! 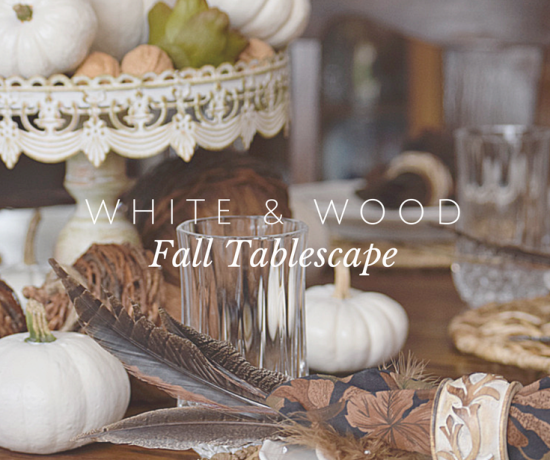 (Haha, see what I did there… 😉 There are tablescapes, vignettes, recipes, mantles and porches galore. 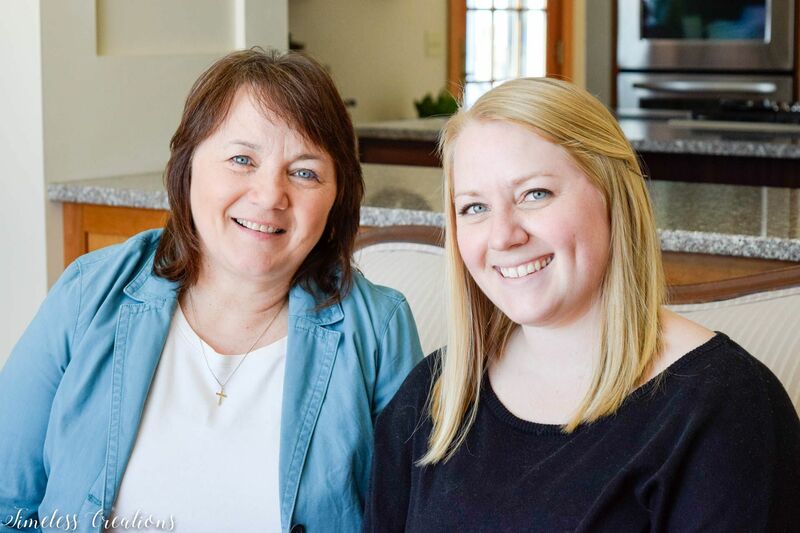 Thanks to Kendra from Joy in our Home for hosting and putting together another great blog hop. We warn you now – we took a TON of photos of this one! 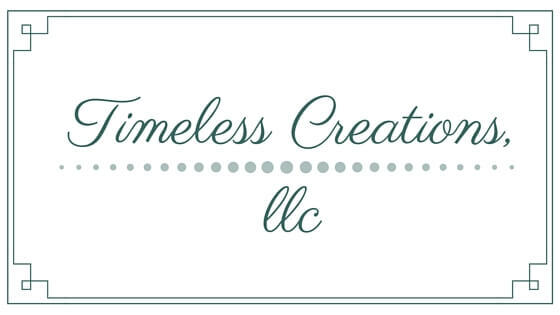 For most of our tablescapes we like to utilize items we already have in our homes, or DIY a project if we need something new. We aren’t ones to go out and buy something expensive when it isn’t needed. 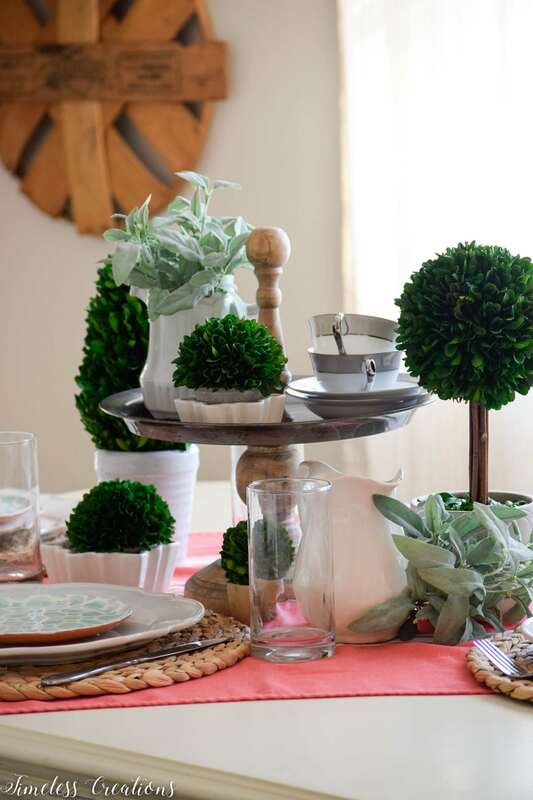 The challenge, therefore, is coming up with a different look so we don’t repeat the same styled table. 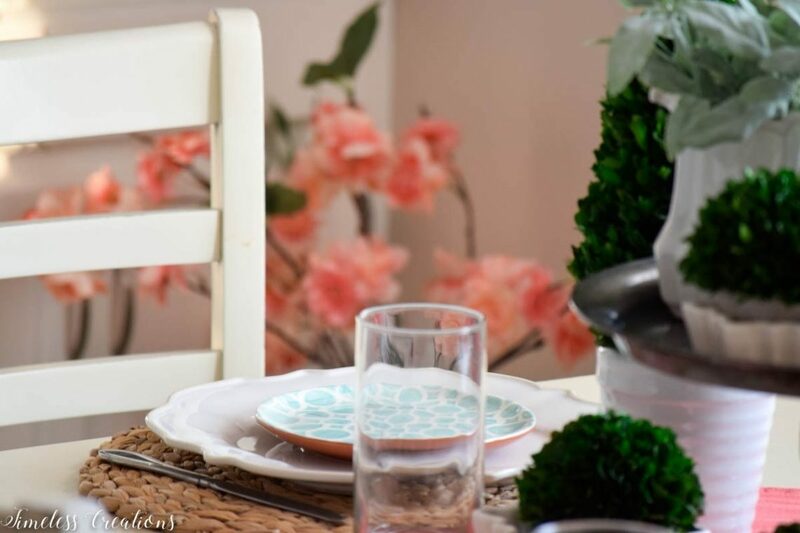 While we reused some of the items (like the dishes and placemats) we still were able to come up with a completely different table than last year’s Spring Tablescape! 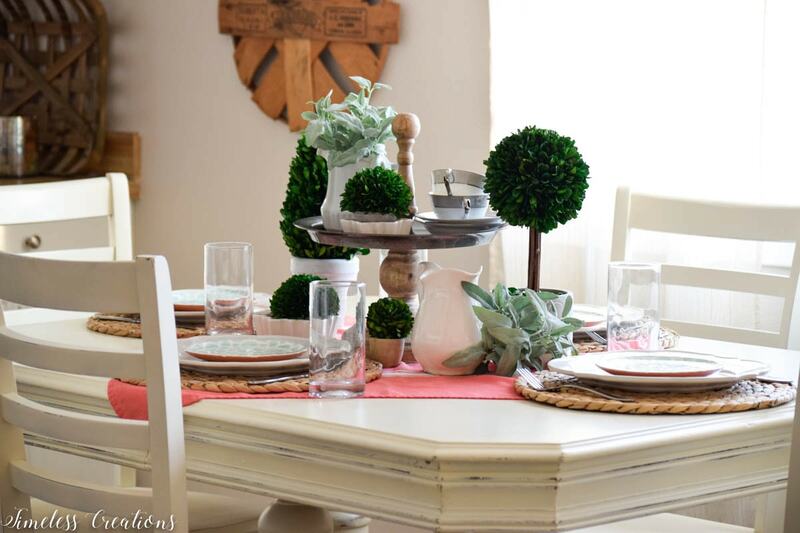 We went to Kristen’s house for this one to use her white table. 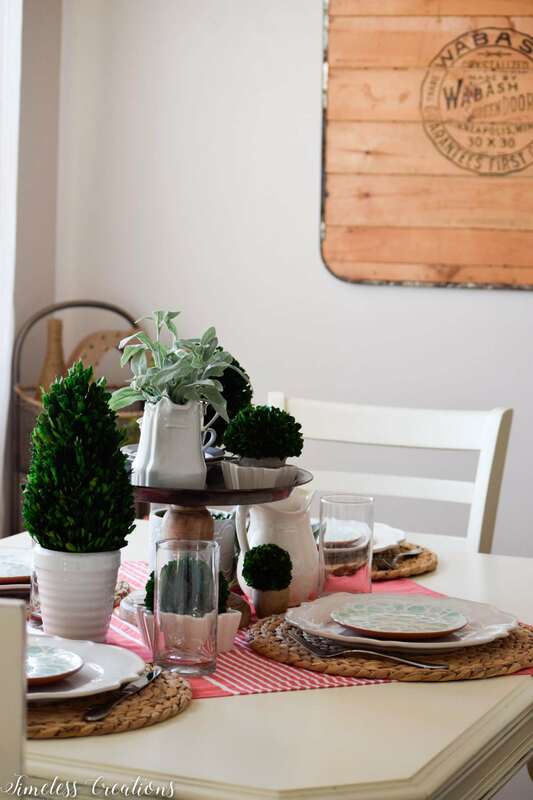 (See the farmhouse style makeover on the table HERE). 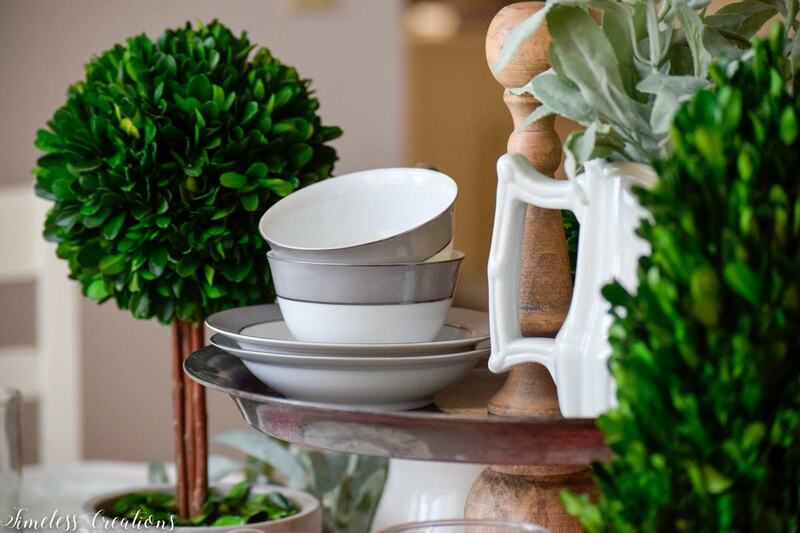 She has her kitchen decorated in Whites, wood tones, and greenery. A bunch of old Ironstone dishes scattered here and there throughout it. This article contains affiliate links for your convenience. We only recommend products we love and use. 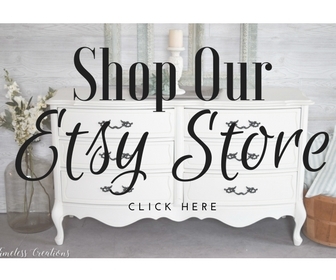 If you purchase something through our link, there is no extra cost to you. 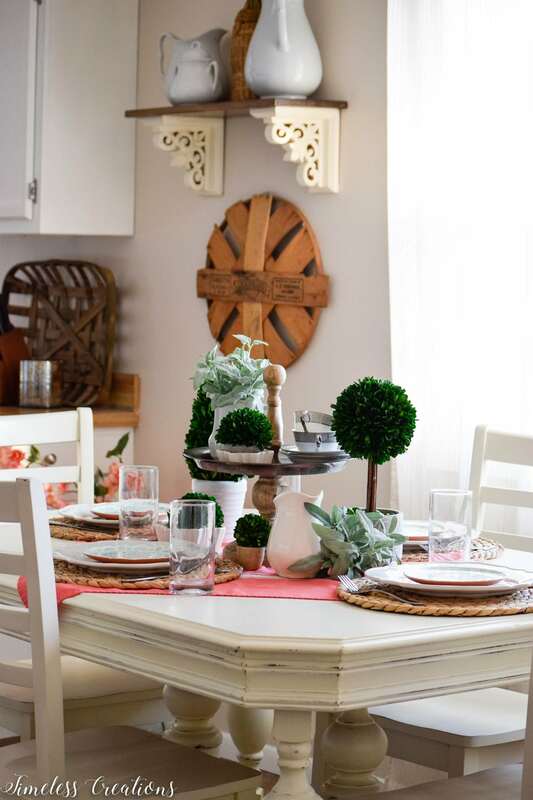 The tablescape was started with the wood and metal tray in the very middle. 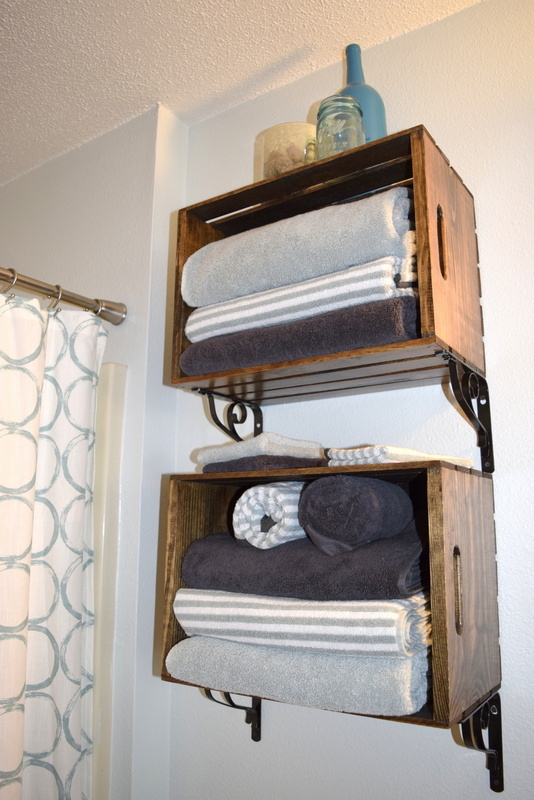 It was an impulse buy for Kristen a couple weeks earlier from one of our favorite stores – Homegoods! And boy did that impulse pay off! It’s just adorable, ties in with the kitchen woods perfectly, and isn’t too tall of a centerpiece. 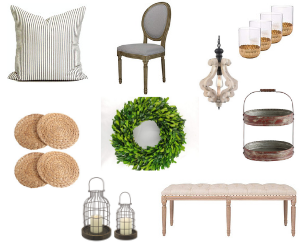 We then decided it would be beautiful to gather all of those boxwood items she had around the house to use in the center! It is, after all, for spring and we look forward to the green grass after months of dreary, colorless winter. 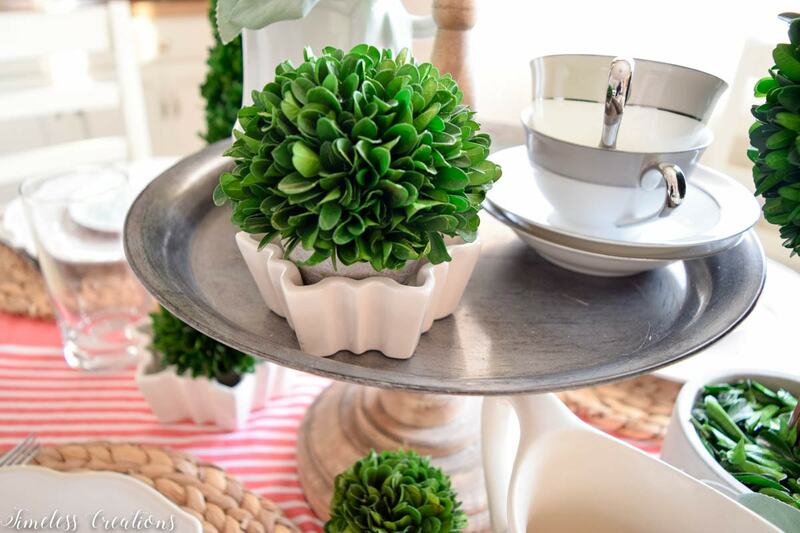 So boxwood topiaries, big and small, were gathered in the middle. But it didn’t look quite right. We just thought for spring there should be some kind of POP of color. In came that pretty pink linen! We looked online for a runner or pretty napkins and didn’t see anything that really excited us. So while putting away laundry, Kristen found that pretty pink dishtowel she had forgotten about!! 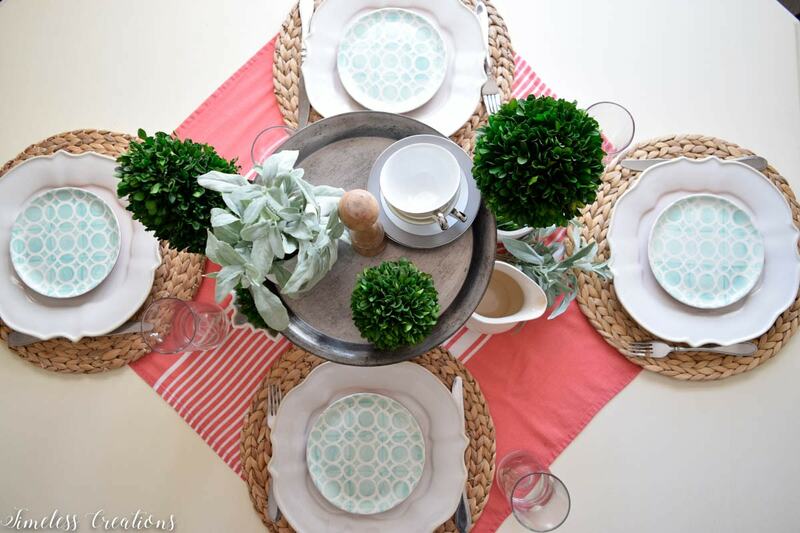 A little ironing and it became the perfect “POP” for our table! And the best part – we didn’t have to buy anything extra! 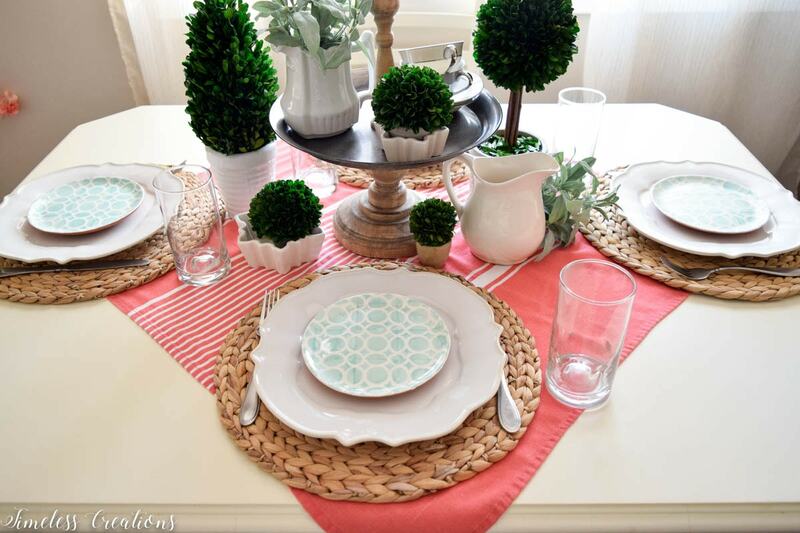 The table was then topped off with Kristen’s favorite woven placemats she uses everyday. 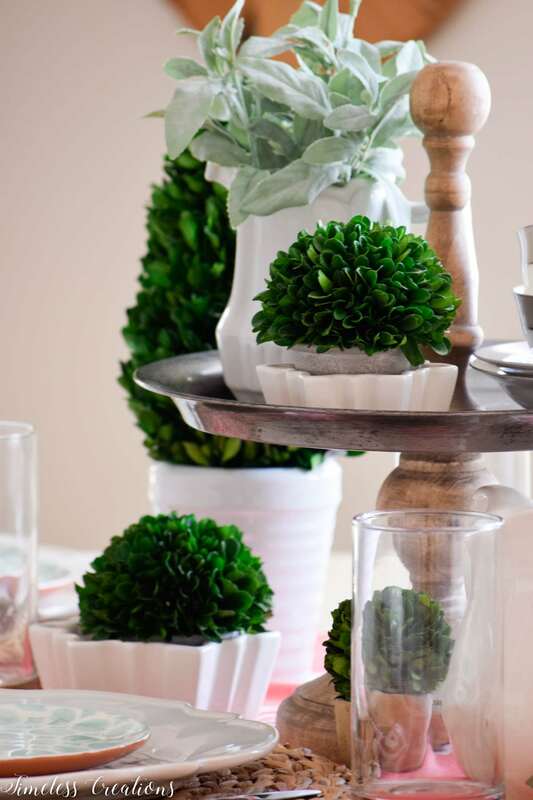 They bring a great texture and different color to the space. They are also quite the juxtaposition to those fancy white plates. 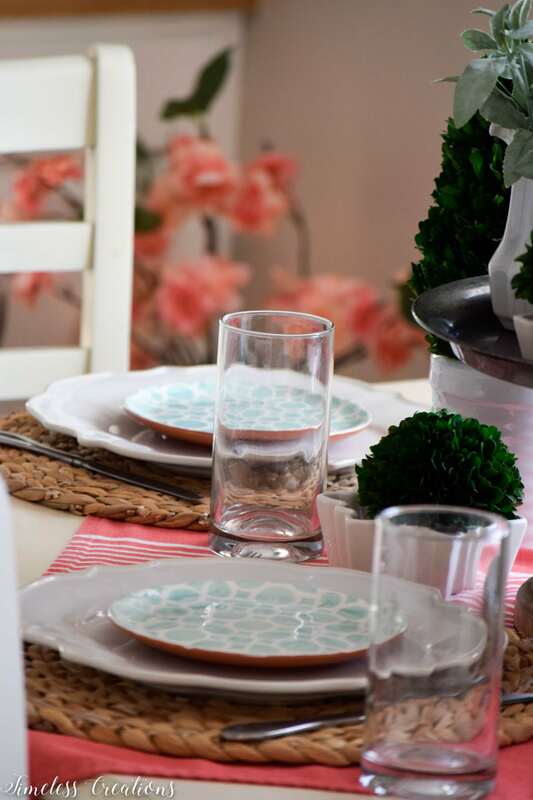 You can find those fancy scalloped plates HERE. 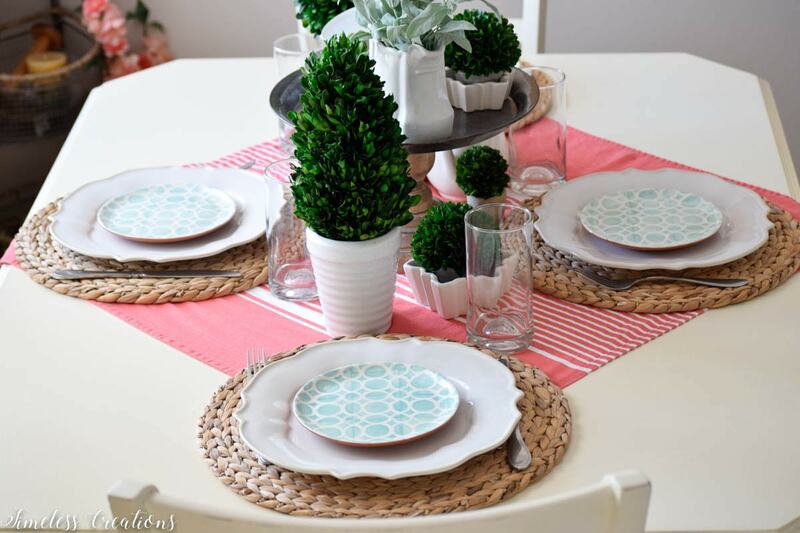 Then with the aqua plates on top, a different color is brought into the space! 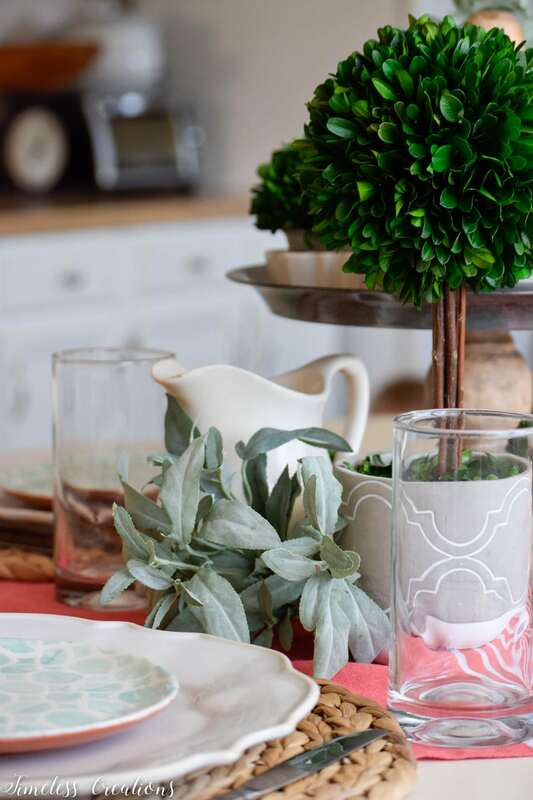 They have such a beautiful little pattern and while the aqua is in the same color family as all the greenery it still brings something different to the table. (P.S. 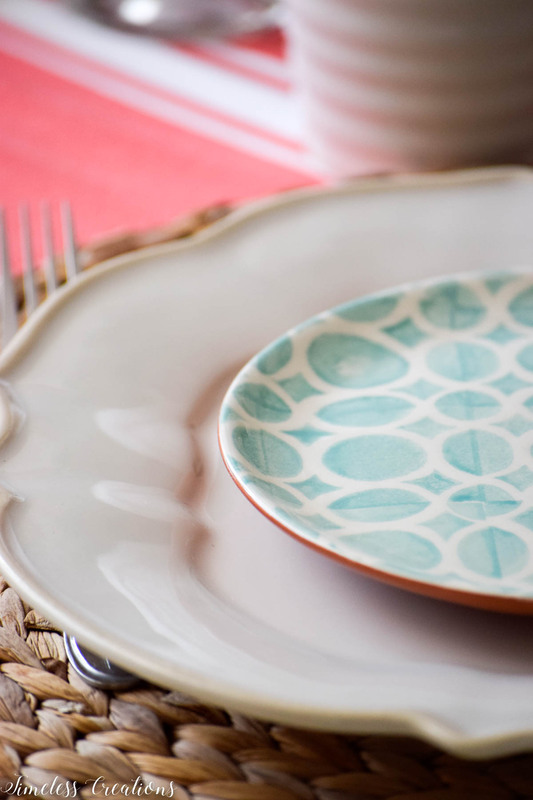 those pretty little plates are on sale right now!! Get them HERE). Two little Ironstone pitchers from different antique markets and shops as well as a couple of Kristen’s Grandma’s teacups were also added for extra decoration. I love this picture – you can really see all of the different colors and textures! So….do you think we took enough pictures! Haha! They are just all so pretty it was hard to edit them down! 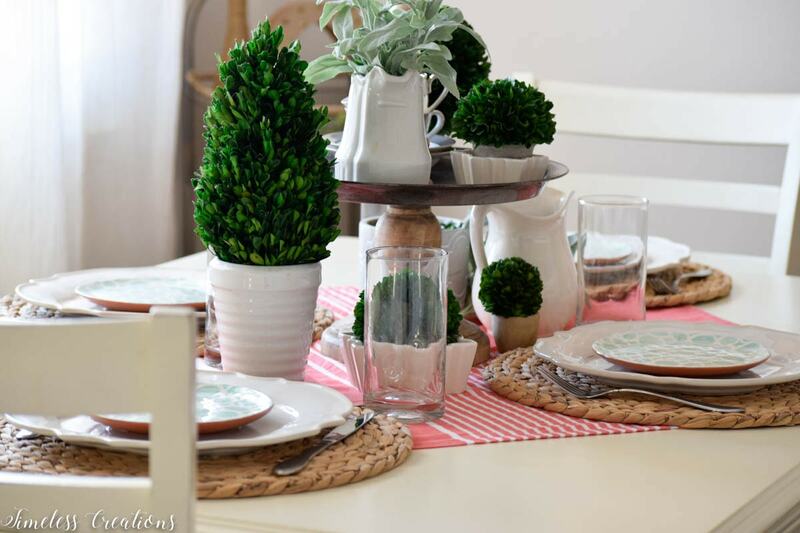 It really is so simple to create a great tablescape using items you have around the house. All it takes is a bit of rearranging! And don’t forget to think outside of the box. 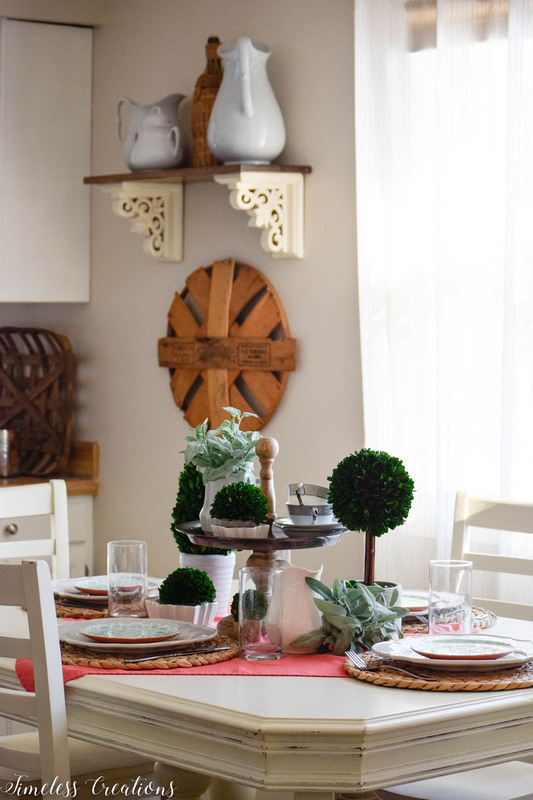 While we were looking for a table runner, a dishtowel actually worked wonders! 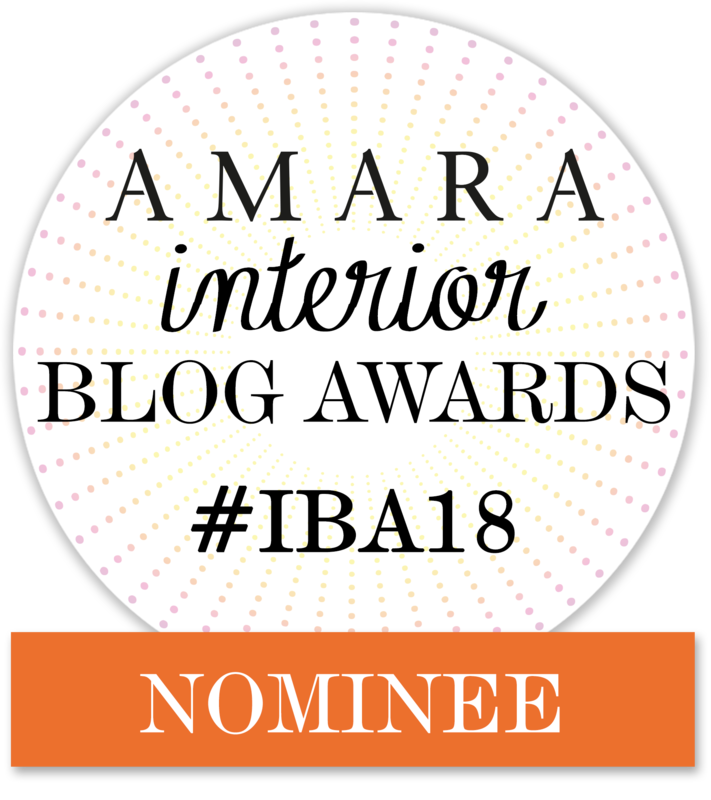 And don’t forget to have a peek at all of the other Spring Inspirations from our blogger friends below. Each day this week the links will open up and you can be bombarded with different spring decor! Come on back each day to see the new posts. 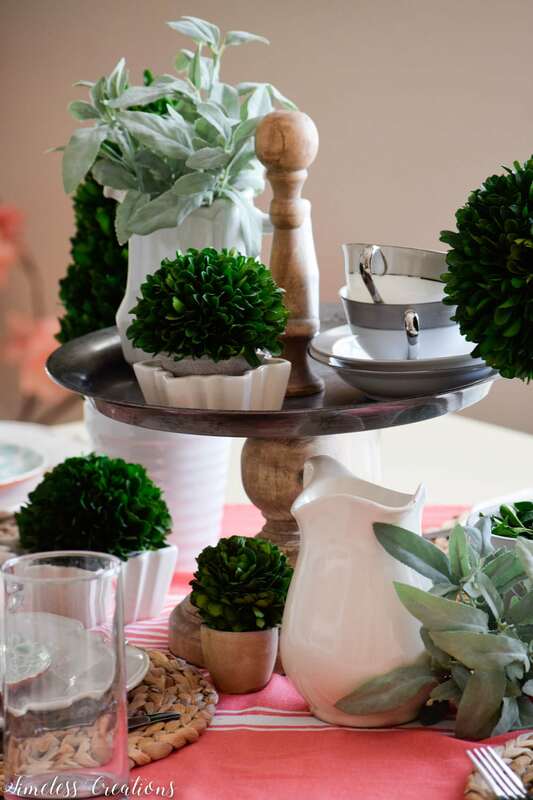 Go on to see how The Crowned Goat created their Spring Tablescape next!